Want to Start a New Approach to Relationships? 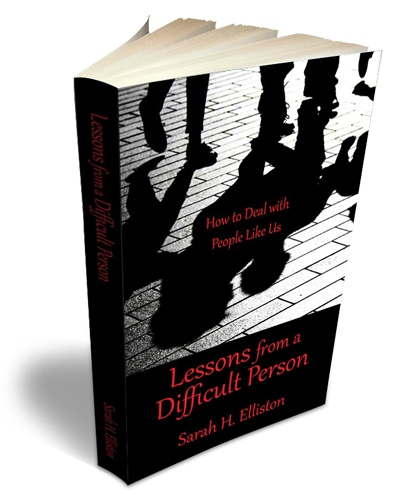 Building on the premise that difficult people don’t know they are difficult, Sarah leads the reader through her own personal development and some of the interactions she realized too late that were attempts to tell her. This chronicle takes you on Sarah’s personal journey from her youth through marriage through teaching experiences and a professional life for a nonprofit corporation. Welcome to my website. Welcome to a voyage of discovery. I’m glad you are here. You can relax about the difficult people in your life because I am a difficult person and will steer your boat in the right direction. Most people don’t know they are difficult and now we can help them and help ourselves at the same time. It is on sale now at Amazon. Also, you will find listings of talks and workshops I am giving on this topic. Check to see if I am coming to your community. Check out my blogs on this topic and others; I add to them frequently. is helping people to stand up for themselves and all people to regain peaceful relationships.